The Redragon M601 Centrophorus is full-size and works well in either hand. It was precision-engineered to feel great even after hours of use. This makes the mouse perfect for long lasting gaming sessions providing maximum comfort and support. The mouse features a 3200 DPI sensor that offers up to 15G of acceleration, 3600 FPS and Teflon feet for ultra-fine control. In addition, the mouse offers many Pro Features such as quick adjustable DPI, programmable buttons, different gamer profiles and an adjustable weight tuning set. The Redragon S101 Gaming Keyboard features; 7-color RGB Backlighting for all 112 keys and a close to perfect blend of features, functionality durability and comfort. The keyboard features an ergonomic design with an oversized spacebar and comfortable wrist rest to minimize fatigue. The 112 keys Full-size keyboard offers quiet, crisp and precise key presses. It’s actually perfect for both home and office. 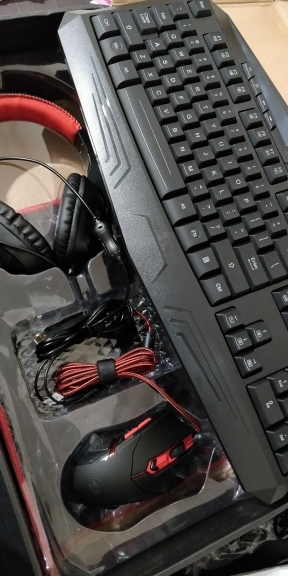 The Lightweight Redragon Garuda Gaming Headset with Microphone is universally compatible with almost any PC, Mac and mobile/tablet device, plus Xbox One and PlayStation 4. The Stereo headset features Noise Reducing Closed Ear Cups with 103dB sensitivity while its 40mm directional drivers deliver extreme audio precision. Ultimate comfort for prolonged gaming sessions is achieved through its highly adjustable Headband and use of Soft Comfortable Signature Memory Foam. The Large Redragon P001 Gaming Mouse Pad is made of Waterproof, Silk-processed cloth surface which ensures smooth, ultra-precise mouse movements. The underside is made of anti-slip natural processed foam rubber offering great flexibility while adjusting to different surfaces. The Stitched Edges prevent damage, fraying and curling.